At least one official at the Federal Election Commission appears to want an investigation into whether Russian agents used Facebook ads to influence the U.S. election. 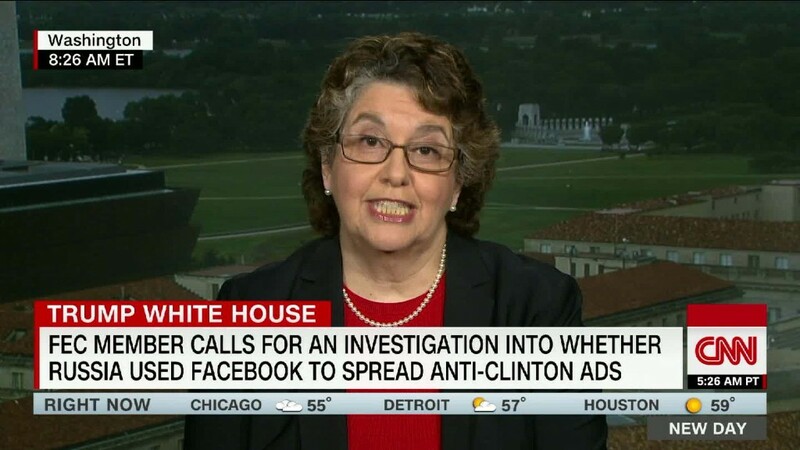 FEC commissioner Ellen Weintraub told CNN's "New Day" she is concerned about "the potential for foreign money creeping into our system" and said spending on Facebook ads would fall under the agency's purview. The interview follows a Politico report claiming Weintraub is pushing the FEC to investigate if Russia paid for Facebook ads to spread negative stories about Hillary Clinton during the campaign. "I had spoken about whether those Facebook (FB) ads would be subject to FEC regulation, and they would be, because we do have jurisdiction over any money that is spent on advertising," Weintraub told CNN's Alisyn Camerota in an interview Wednesday. "I have spoken out on many occasions about my concern about the potential for foreign money creeping into our system," Weintraub continued. "And I've tried on numerous occasions to introduce stronger rules to the FEC to try and ward that off." Foreign nationals are banned from donating to political campaigns or spending money in connection with U.S. federal, state and local elections. Weintraub, a longtime Democratic commissioner at the FEC, said she's struggled to implement greater protections against foreign influence in U.S. elections due to opposition from Republican commissioners. The FEC is set up to be split evenly, with three Democrats and three Republicans. The opposition, she noted, "started" when current White House counsel Don McGahn was an FEC commissioner from 2008-2013. The U.S. intelligence community has said Russia ordered an "influence campaign" intended to hurt Clinton and help Trump during the 2016 election. That included the use of "pro-Kremlin social media actors," according to a declassified intelligence report. Separately, Facebook has faced criticism for not doing more to fight the spread of fake news during the campaign -- a problem it has since begun to combat more aggressively. A Facebook official told CNNTech the company has no evidence of Russian agents buying ads to spread misinformation on the platform. Facebook notes on its website that "advertisers are responsible for understanding and complying with all applicable laws and regulations."